The OEM is a lifting and material handling solutions company reporting in five business segments: Aerial Work Platforms, Construction, Cranes, Material Handling & Port Solutions and Materials Processing. The OEM manufactures a broad range of equipment serving customers in various industries, including the construction, infrastructure, manufacturing, shipping, transportation, refining, energy, utility, quarrying and mining industries. Recent changes to hydraulic and fuel systems within modern machines has improved overall machine performance but has added complexity to their operation systems which are now more susceptible to contaminates in the respective fluids which have the potential to cause serious damage. The challenge was to source a supplier of fuel and hydraulic tanks whom could ensure the internal cleanliness of the tanks reducing the possibility of harmful contaminants entering the system. Keltech developed a post paint wash system. Tanks are washed and then all final fit tank furniture is assembled, filters, site levels, manifolds etc, all remaining port holes then blocked with plastic caps. 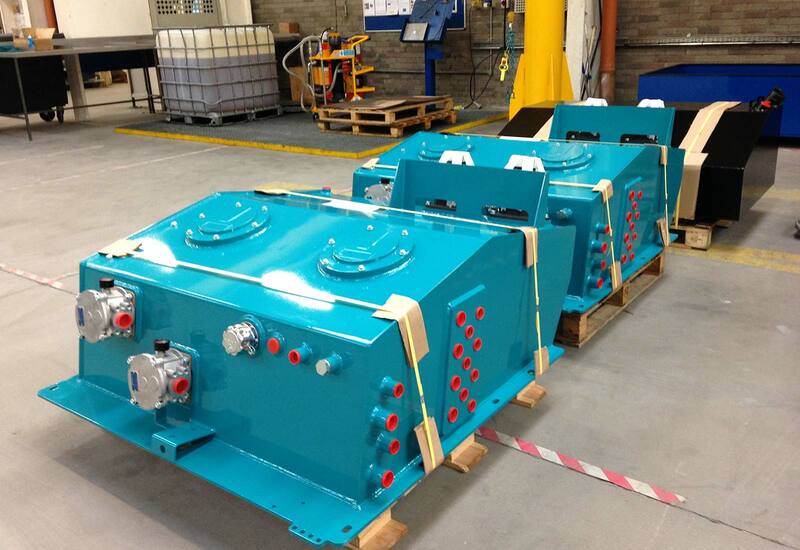 Tanks are now fully furnished and are ready to be offered up directly to the machine, the OEM no longer have tank assembly cells. Tank now becomes a 1 line item for the buyer as Keltech control the complex BOM.